Here is a calvacade of New Orleans bands that made jazz history. They came in all sizes and varieties, with as many approaches to the music as there were leaders. All of those listed and pictures are not purely jazz bands. Some are, of course, but orhers, not similarly oriented, nevertheless sometimes played the real jazz. First, when we use the term 'jazz band' we are talking about a group of musicians playing in 2/4 or 4/4 time, improvising collectively on any theme. Usually these bands emphasized counterpoint rather than conventional harmony. 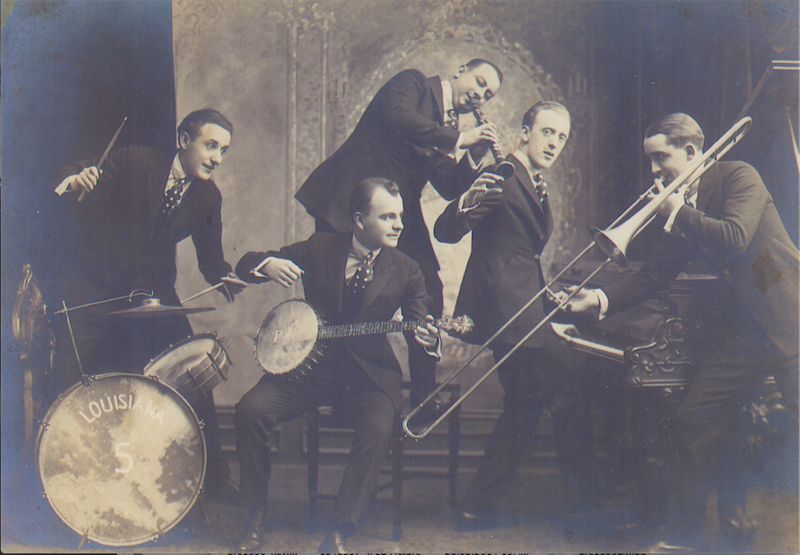 By a `dixieland band` we mean a group of from five to eight musicians, consisting of a frontline cornet or trumpet, clarinet an trombone, plus a rhythm section. The group will have memorized certain parts of each tune in their fixed repertoire. (This is why it is calles a 'head arrangement'). It includes some collective improvisation, but usually is more occupied with ´hot´ solos. Sometimes there is a saxophone in a dixieland band. When we say 'dance orchestra', we are meaning it in the New Orleans jazz- sense. Thus, what we mean is any group of musicians employed to play for dancing which is capable of reading written scores. However they are all supplied with a number of tunes, which they play without music in the dixieland tradition. A 'novelety orchestra' is one that depends largely on showmanship, odd or homemade instruments, slapstick and other items of 'skiffle' origin. Frequently, however, such groups are of excellent jazz quality. 'String bands', of course, are just what the name specifies. 'Brass bands' are a big enough classification to be covered elswhere in this volume as a seperate group. 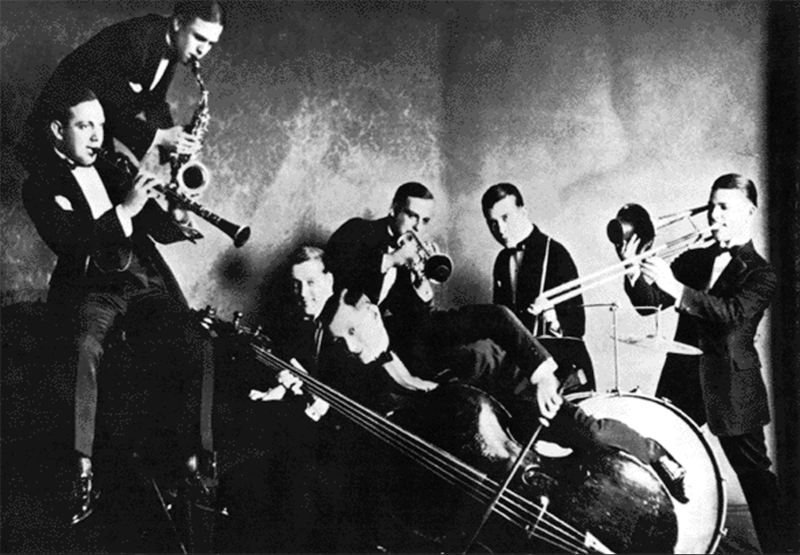 Our first knowledge of an organized jazz band using conventional instruments dates back to 1889 played for dance events and social activities. However, the authors disclaim, here and now, any implication that this was, in truth, the first jazz band. In fact, we are convinced that the development of jazz was so gradual as to make specious any such claim as related to an individual or group.